Upjers (www.upjers.com), German developer and publisher of browser games, is releasing two new game apps for Android and iOS today. As of now, Upjers Aqua and Upjers Pirate are ready for download in the App Store and the Google Play Store. Four weeks ago, Upjers presented their first games developed for mobile devices, namely Upjers Cube and Upjers Bubble. Additional game apps are currently in development. Upjers Aqua is a swift arcade game with a dynamic and challenging, although easy game play. Its 3D underwater environment is extremely fun from a visual and technical point of view. Deep in the ocean, right next to corals and anemones, sits Gary the Crab. A whole array of fish has been tangled in his spiral shell – and even more and more fish will tangle up! The only way to set them free is to catch three or more fish of the same type. The bubbles will pop and the fish are set free. Speed is the key to the next level! Upjers Aqua is available in the Google Play Store as well as the App Store as Lite and Premium version. Players who are already playing the browser game My Free Pirate and all other fans of pirate games should look forward to the Unity 3D game app Upjers Pirate. Fire cannons, win Coins and Jolly Rogers and experience many adventures in the Caribbean – on your mobile device! Players who are already registered for the browser game My Free Pirate can use their log-in data in order to play this app and have the possibility to transfer Coins and Jolly Rogers from their mobile to their browser game account. This Upjers Pirate companion app is available for free in the Google Play Store and in the App Store. 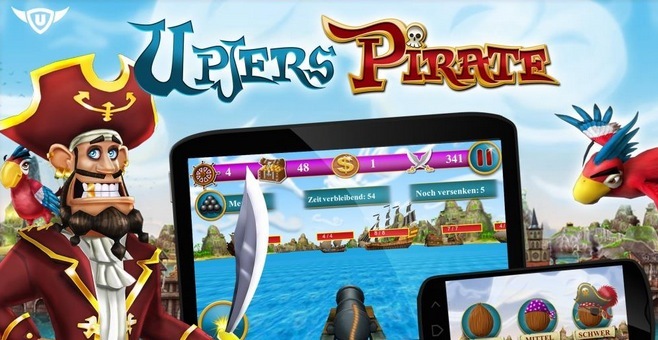 Upjers Aqua and Upjers Pirate have been released shortly after Upjers’ existing mobile games Upjers Cube and Upjers Bubble. Currently, Upjers experiment with different models in the fields of development, game design, monetization and the marketing of mobile games. Tagged Aqua, extending, Pirate, portfolio, Their, Upjers.